SUCCESS IN EUROPE FOR B.I.M.A. 1999 and 2000 were 2 FANTASTIC years for B.I.M.A. 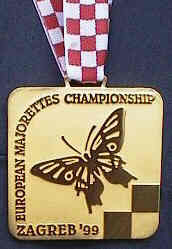 with GOLD in 1999 at the 1st ATTEMPT and SILVER and BRONZE in 2000. 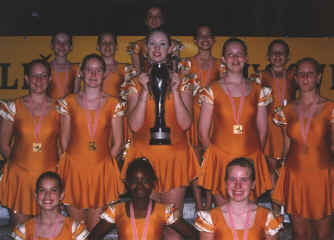 Below are the 1999 EUROPEAN MAJORETTE CHAMPIONS! in ZAGREB - CROATIA. PUTNEY SHANGRI-LA MAJORETTES from PUTNEY - LONDON. Above GOLD for PUTNEY SHANGRI-LA MAJORETTES! Below WITHAM MAJORETEES from WITHAM in ESSEX! WINNERS of SILVER & BRONZE MEDALS in 2000 in PREROV - CZECH REPUBLIC! Below NEW IMAGE MAJORETTES from HAVERHILL in SUFFOLK! WINNERS of BRONZE MEDALS in 2000 at PREROV - CZECH REPUBLIC. In 1999 The BLUE GEMS MAJORETTES from HECKMONDWIKE in WEST YORKSHIRE also Reresented B.I.M.A. in the EUROPEAN MAJORETTE CHAMPIONSHIPS in ZAGREB - CROATIA and gave DISPLAYS that should have WON them GOLD had the SECTIONS been DIVIDED as B.I.M.A. do. 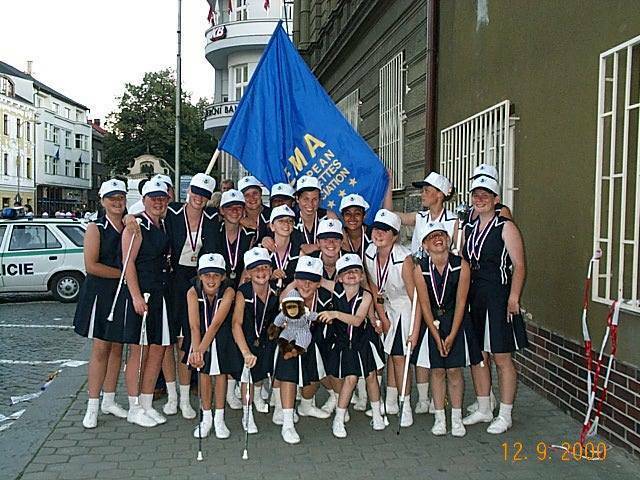 In 2000 The GUERNSEY MAJORETTES from GUERNSEY also Represented B.I.M.A. in the EUROPEAN MAJORETTE CHAMPIONSHIPS in PREROV - CZECH REPUBLIC and gave CREDITABLE DISPLAYS. In 2000 The LYNBAR MAJORETTES from LEEDS in WEST YORKSHIRE also Reprsented B.I.M.A. in the EUROPEAN MAJORETTE CHAMPIONSHIPS in PREROV - CZECH REPUBLIC and also gave CREDITABLE DISPLAYS.